Links to this page can be found in Book 7, Map A3, Day 2, View B8 and Rione Monti. The real subject of this 1756 plate is the tribune of S. Maria Maggiore on the Esquiline Hill, rather than the unassuming friary of S. Paolo Primo Eremita. 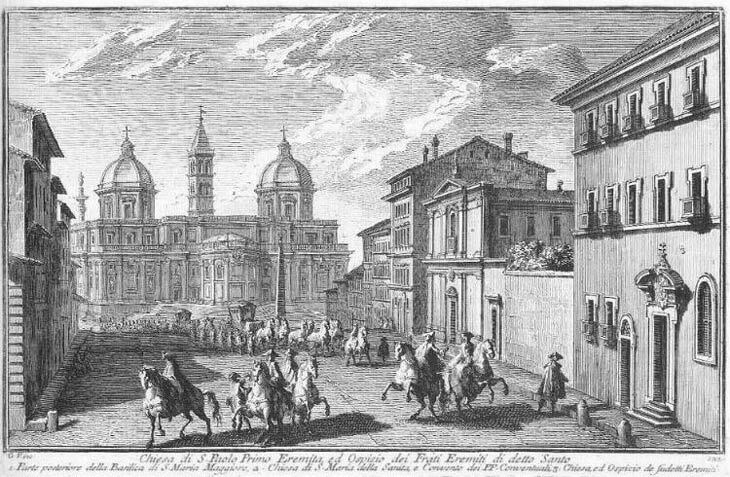 It is one of three etchings by Giuseppe Vasi showing the Basilica (the others are plate 48 - front view in 1753 and plate 157 - side view in 1756). In 1771 Vasi depicted the tribune in a larger etching. The view shows a section of Strada Felice, the street which links S. Maria Maggiore to SS. Trinità dei Monti. The street was opened by Pope Sixtus V whose name before the appointment was Felice Peretti. The view is taken from the green dot in the small 1748 map here below. 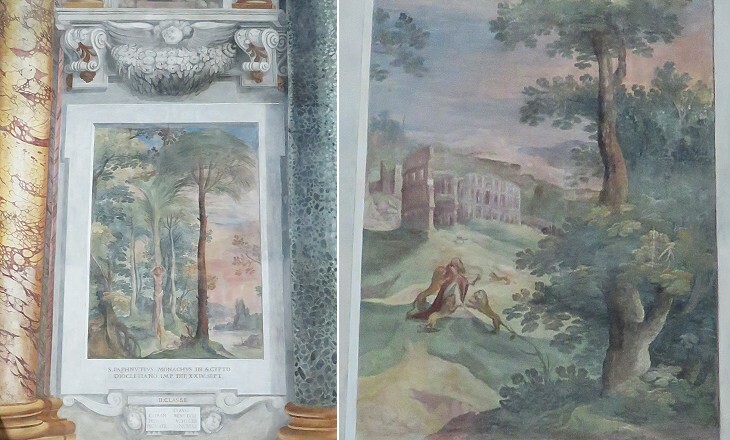 In the description below the plate Vasi made reference to: 1) Rear side of S. Maria Maggiore; 2) S. Maria della Sanità; 3) S. Paolo Primo Eremita. The small map shows also 4) S. Norberto; 5) S. Dionigi Areopagita; 6) S. Vitale. The area was largely modified by the opening of Via Nazionale in the 1870s. The photo was taken immediately before the intersection between this street and Strada Felice. In the 1920s the construction of Palazzo del Viminale led to pulling down S. Maria della Sanità and part of the monastery adjoining S. Paolo Primo Eremita. c) Via Sistina from Piazza Barberini to SS. Trinità dei Monti. The church was dedicated St. Paul of Thebes who is regarded as the first Christian hermit. He lived in the desert in a cave where he found a spring. A palm tree provided him with food and leaves with which he covered himself. Every day a raven brought him some bread. At his death two lions dug his grave by using their paws (he shared this honour with St. Onophrius). A religious order inspired after the life of this saint was endorsed by Pope Clement V in 1308. The Roman monastery was founded in 1669; the monks were mainly Hungarians and Poles. 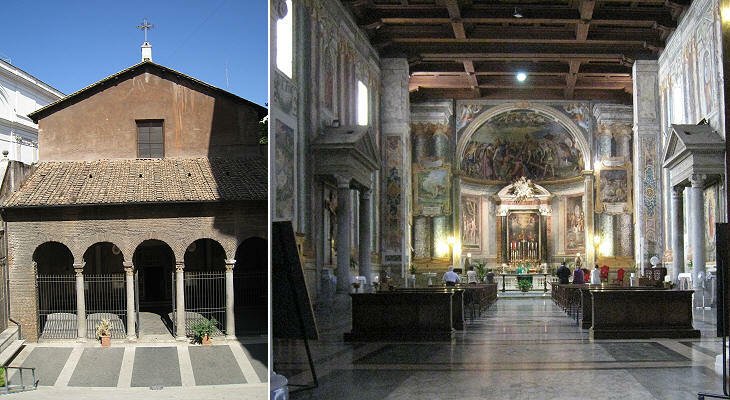 The church shown in the plate was replaced by a new one which was designed by Clemente Orlandi in time for the 1775 Jubilee Year; the small portico has points in common with Gian Lorenzo Bernini's S. Andrea al Quirinale, whereas the use of concave and convex lines recalls S. Carlo alle Quattro Fontane by Francesco Borromini. The church was deconsecrated in 1873 and today it belongs to the Italian Home Office. There were two other monasteries with a church in this section of Strada Felice (S. Norberto and S. Dionigi Areopagita). They are both lost although some references to religious institutions can be found in the current buildings. 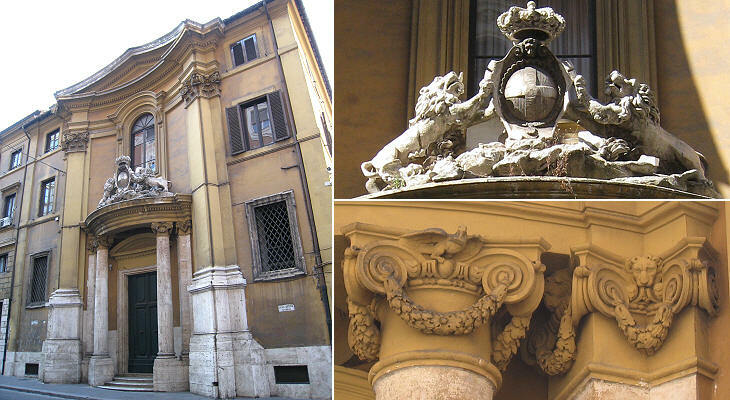 Palazzo del Viminale is one of the last stile umbertino buildings in Rome. It was designed in 1911 by Manfredo Manfredi and it was completed in 1925. 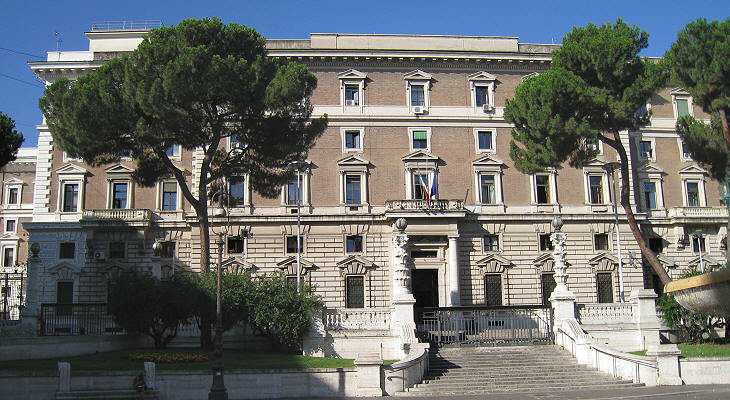 The Italian Cabinet (Consiglio dei Ministri) met in this palace until 1961 (today it meets at Palazzo Chigi). Its construction and that of other adjoining buildings led to the levelling of a vast area, thus making the Viminal Hill rather difficult to notice. 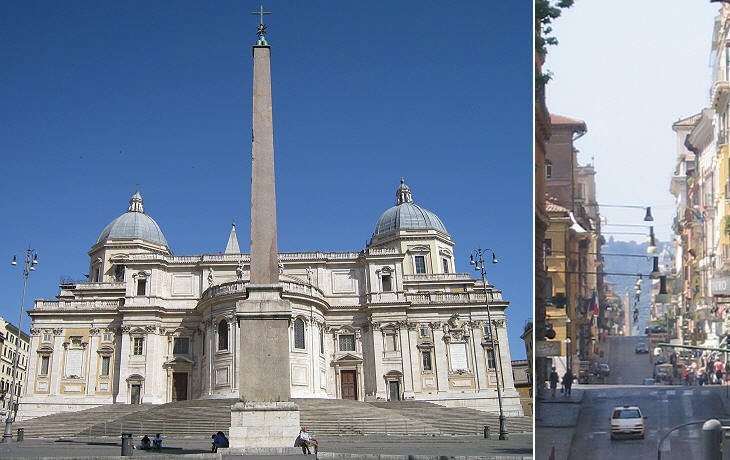 The obelisk was relocated to the Esquiline Hill by Pope Sixtus V in 1587; originally it was at the entrance of Mausoleo di Augusto together with a second obelisk which is now in Piazza del Quirinale. The Pope dedicated the obelisk to the Holy Cross: a bronze cross was placed above the heraldic symbols of the Pope (as you can see in the image used as background for this page). From the base of the obelisk it is possible to see the full length of Strada Felice. 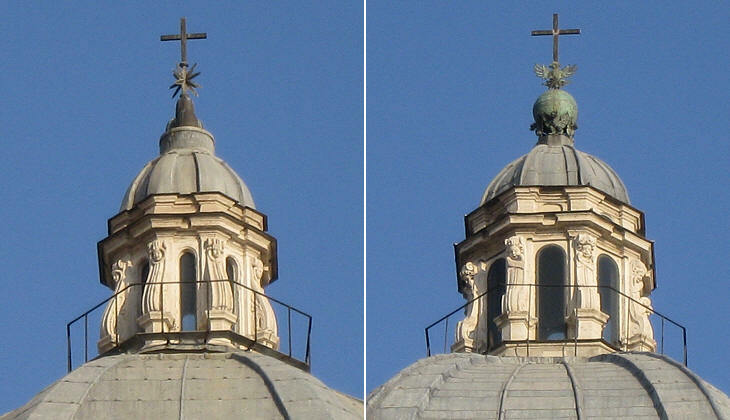 The rear view of S. Maria Maggiore is marked by the large domes of Cappella Sistina, built by Pope Sixtus V in 1587 and of Cappella Paolina which was built a few years later by Pope Paul V. They can be distinguished by the heraldic symbols of the popes (those of Pope Paul V were eagles and dragons). The completion of the two chapels and of their domes made the size of the old medieval apse seem too small. 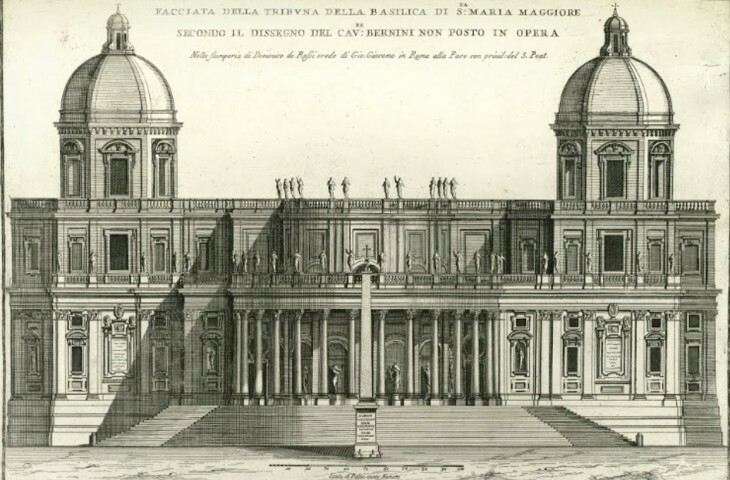 In 1669 Pope Clement IX endorsed a project by Gian Lorenzo Bernini (it opens in another window) which was based on the construction of a new larger apse surrounded by a colonnade. 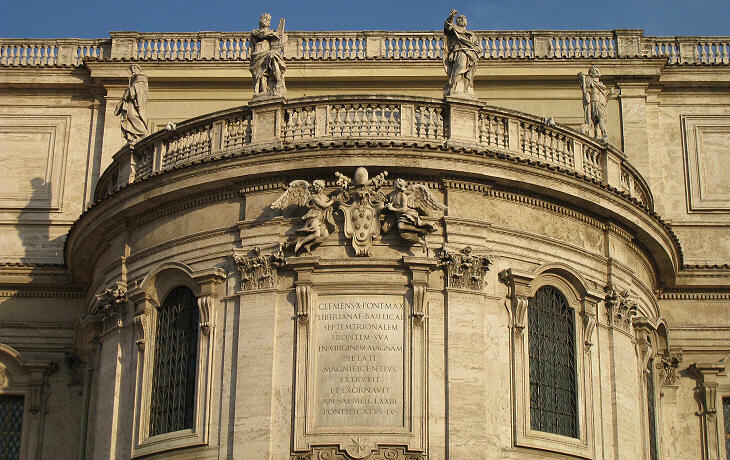 The cost of the project was initially underestimated by Bernini, perhaps to ease the papal approval. Pope Clement X in 1670 stopped the execution of the project. In 1673 Carlo Rainaldi redesigned the apse appearance, making it look larger, but without touching its interior. Bernini had planned to decorate the new apse with 47 statues, Rainaldi drastically reduced their number to four. They joined the many Roman statues which stand close to Heaven. In the XVIIIth century a narrow downhill street off Strada Felice led to the old church of S. Vitale which Pope Sixtus IV rebuilt in 1475. 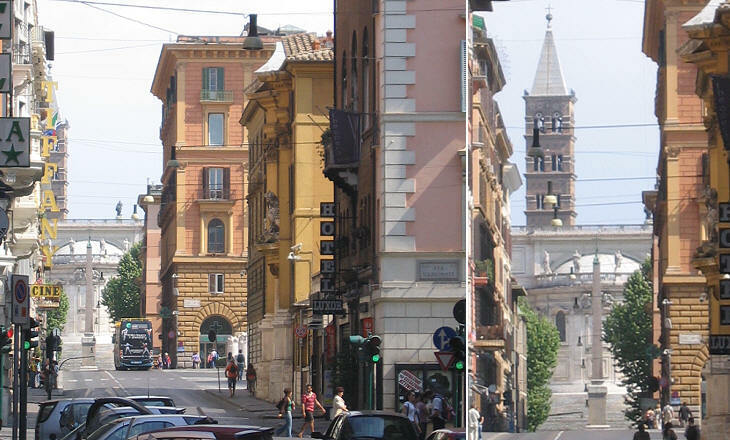 Today S. Vitale is located along Via Nazionale; because town planners wanted the new street to have a smooth inclination they raised the level of the ground and the church ended up below the current street level. You may wish to see the façade as it appeared in a 1588 Guide to Rome (it has not changed very much). In 1595 S. Vitale was assigned to the Jesuits of S. Andrea al Quirinale who undertook a large program of restoration and decoration of the building. The simple façade leads to a very interesting interior which was painted with dramatic scenes of sufferings and deaths of martyrs. 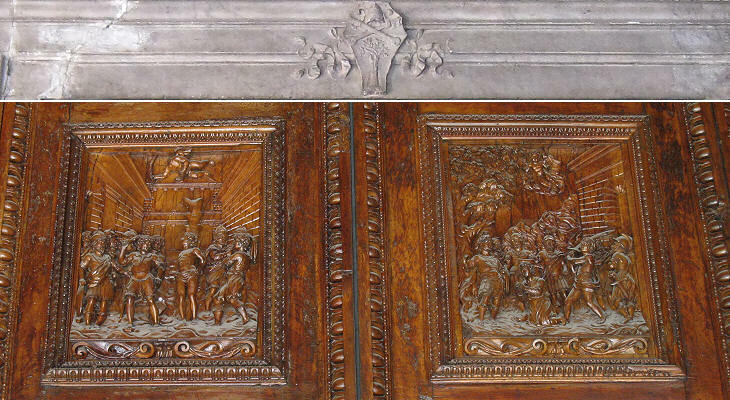 The finely carved doors give the visitor an anticipation of what he is going to see. The paintings at S. Vitale had an educative purpose. They functioned as a training-ground for apostolic work, in the Roman as well as in the international context. Young Jesuit novices were taught how to fulfil their duties as parishioners and missionaries, for which they could practice on the Italian and foreign visitors. The primary aim was to teach the Christian Doctrine according to the Catholic Church, either with the aim of strengthening the Faith, or of converting pagans in Protestant countries or faraway regions. (..) As exemplified in the "Peinture Spirituelle" by Fr. Louis Richeome, (1544-1625) a French humanist and Jesuit, the tour of S. Vitale was a form of instruction in Christian Doctrine with the help uf "mute" images. These would turn into "speaking" images when the language they spoke was properly explained. Some of the frescoes however offered visitors a chance to rest their eyes on large landscape paintings where the sufferings of the martyrs were hardly noticeable. 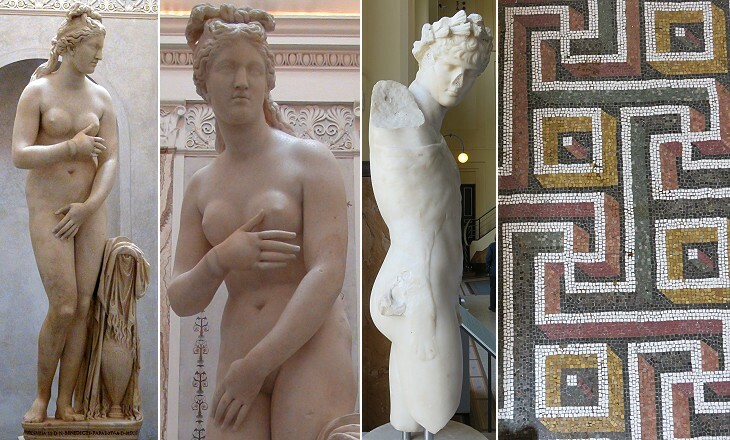 In 1752 Pope Benedict XIV donated a statue of Venus to the City of Rome which became known as the Capitoline Venus. It was seized by Napoleon, but it was returned to Rome in 1815. Mark Twain wrote a short story about the statue after having seen it in 1867: The Capitoline Venus is still in the Capitol of Rome (in a specially built cabinet at Palazzo Nuovo) and is still the most charming and most illustrious work of ancient art the world can boast of. The development of the land along Via Nazionale near S. Vitale led to discovering a statue of Antinous, the favourite of Emperor Hadrian. He was portrayed while taking part to a Dionysiac dance; he wears the skin of a panther, a symbol of Dionysus. Next plate in Book 7: Chiesa di S. Maria delle Grazie. Next step in Day 2 itinerary: Chiesa di S. Pudenziana. Next step in your tour of Rione Monti: Chiesa di S. Pudenziana. Quindi seguitando il cammino per la strada dritta, aperta dal mentovato Sisto V. e perciò chiamata strada felice, si trova a sinistra in primo luogo la chiesa di s. Maria della Salute coll'ospizio de' vescovi Orientali, ora collegio de' frati Conventuali; e appresso siegue l' Ospizio e Chiesa di S. Paolo primo Eremita. Vivono in questo alcuni religiosi sotto l'invocazione di detto Santo, venuti dall'Oriente per qualche giusto motivo; ed incontro evvi il collegio de' Premostatrensi. Entrando poi nel vicolo accanto, si trova il giardino col nobilissimo casino Strozzi, in cui sono delle belle statue antiche, e moderne, con altre altre rarità. Dal Pontefice Alessandro VII. fu fatta questa prospettiva con disegno del Cav. Rainaldi; l'esteriore però della cappella Borghesiana fu architettata da Flaminio Ponzio; e le statue sono di diversi; questa di s Luca e di s. Girolamo sono opere del Valsoldo; il s. Marco del Mochi; il s. Mattia del Sonzino, ed il s. Efrem di Stefano Maderno. Il piccolo obelisco che quì si vede eretto, era del mausoleo di Augusto, e fu quivi trasportato per ordine di Sisto V. in ornamento di questa Basilica, erigendovi sopra lo suo stemma il segno della ss. Croce, tutti di metallo. A destra si vede questa chiesa, che fu eretta l'anno 416. da Innocenzo I. e dedicata ai ss. fratelli Gervasio, e Protasio martiri figliuoli di s. Vitale, che fu sepolto vivo in odio della s. Fede. Dopo varj restauramenti, essendo questa nell'anno 1595. unita a quella di s. Andrea de' padri Gesuiti, fu quasi rinnovata da D. Isabella della Rovere principessa di Bisignano, ed è ornata di molte pitture a fresco; quelle della tribuna sono d'Andrea Comodo, e quelle avanti del Ciampelli, il resto sulle pareti della chiesa sono di altri, e li strumenti, che i gentili usavano per tormentare i Cristiani dipinti nel portico, sono del P. Gio: Batista Fiammieri, il quale dipinse a olio ancora i due quadri ai lati dell'altare maggiore. Ritornando poi sulla strada felice, evvi a sinistra la chiesa di san Dionisio Areopagita eretta l'anno 1619. da' Frati della ss. Trinità del Riscatto Francesi; nella cappella a destra vi è la ss. Vergine dipinta da Monsù Dansì; e quella nell'altare maggiore è di Carlo Cesi.